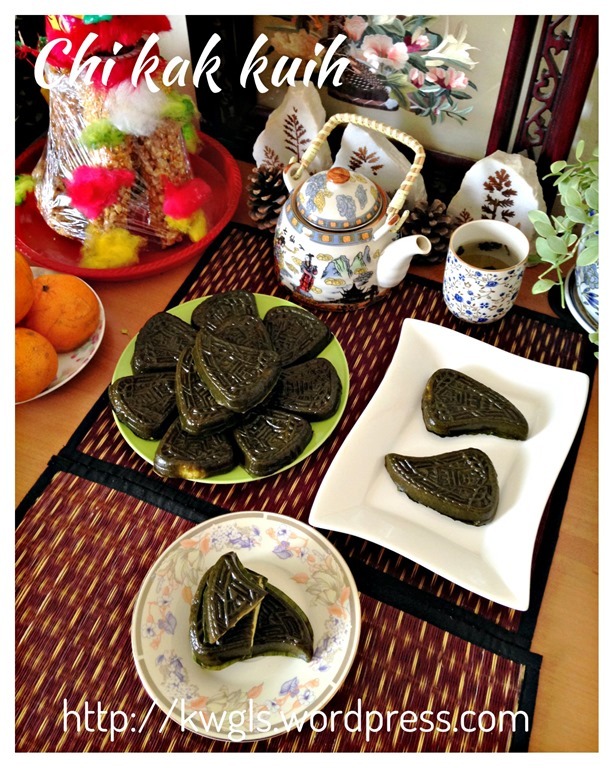 The steamed cake in this post is called “chi kak kuih” or “鼠麹粿“, a type of steamed glutinous rice cake that are common in the coastal province of People’s Republic of China especially in the the province of Guangdong and Fujian. 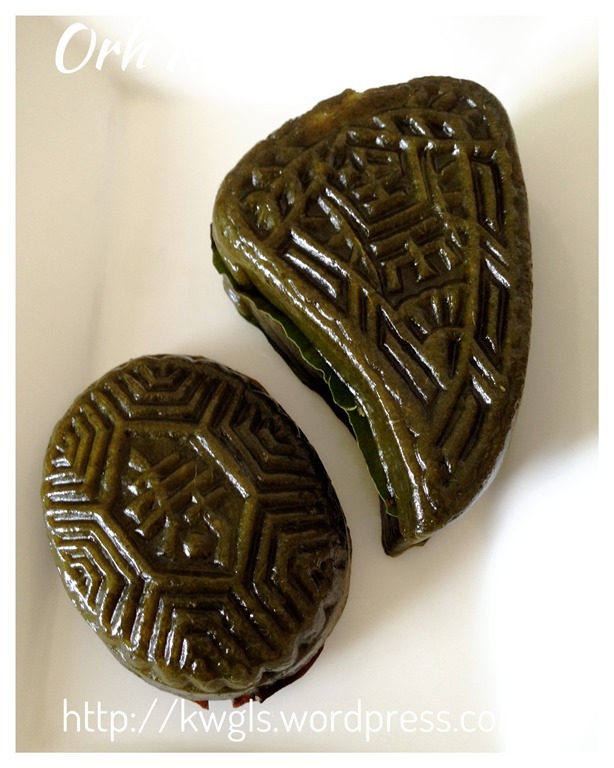 Traditionally, in China, for this rice cake, a type of special herb called Gnaphalium affine or Jersey cudweed is needed. It is what is look like as in the picture below. All these while, I know mugwort are used to prepare black tortoise or orh ku kuih (黑龟糕）for my dialect Chawan and such statements are probable. 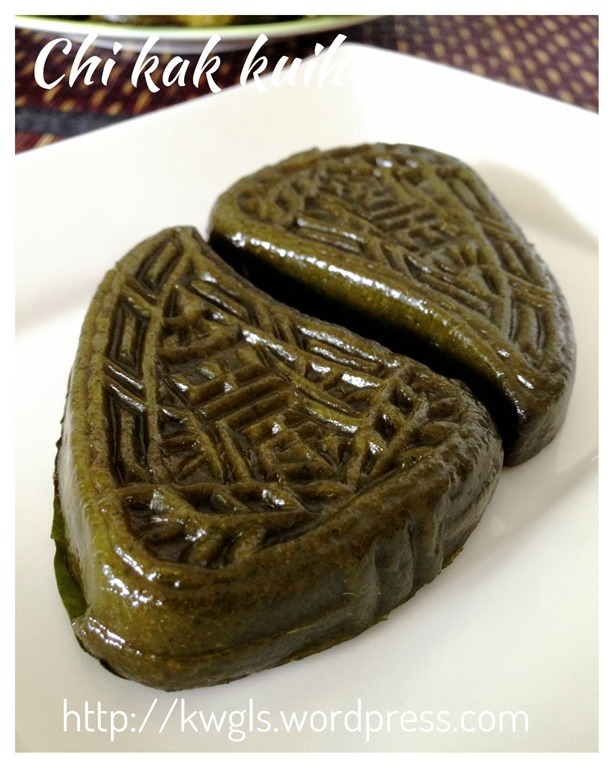 But I am puzzling that the “chi kak kuih” sold in Singapore never had any aroma of mugwort (or “hia” in Teochew and Chawan dialects). Well, don’t ask me what they used for the preparation of the kuih sold in the stores.. I am equally puzzled also.. Therefore, for this illustration, I have decided to use the mugwort leaves that I am familiar with. 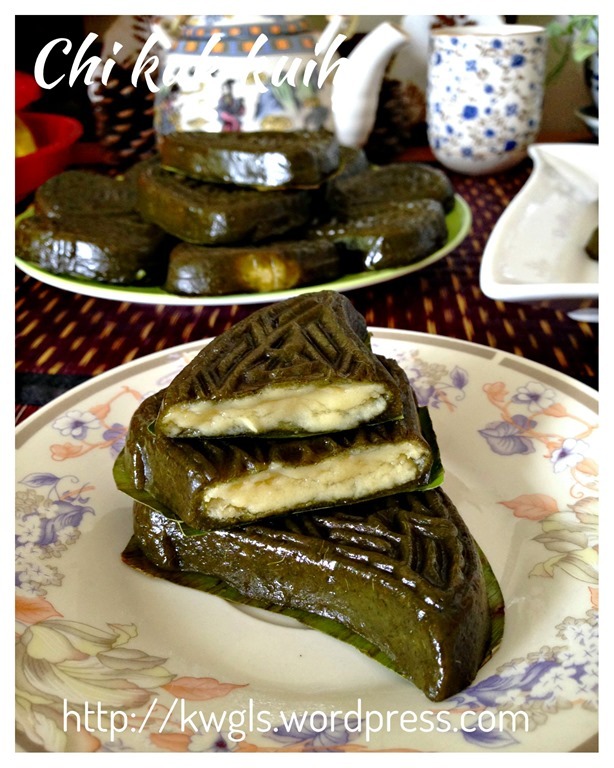 If readers can get the correct cudweed (chi kak cao) from China or other sources, the same recipe shall apply. Just substitute the mugwort with cudweed. 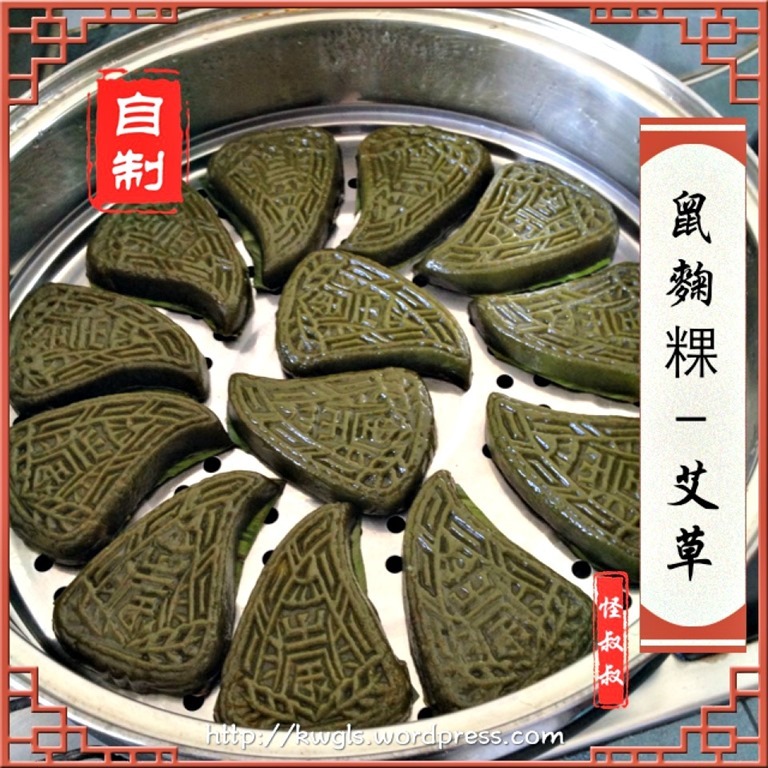 As for the fillings, you can either use this sweet mung bean paste filling (甜馅） or the sweet savoury mung bean paste filling （咸甜馅） in the above Black tortoise Cake post. 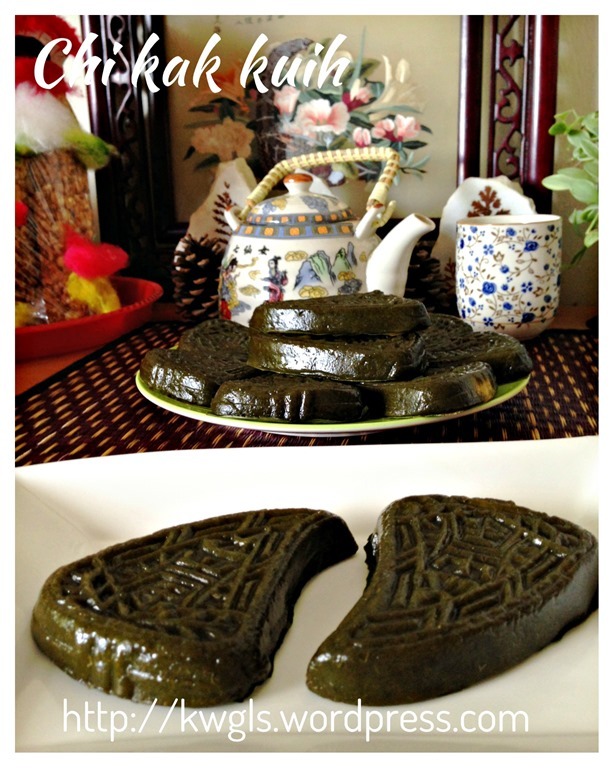 In fact, for Chawan, black tortoise is always associated with sweet savoury mung bean filling. 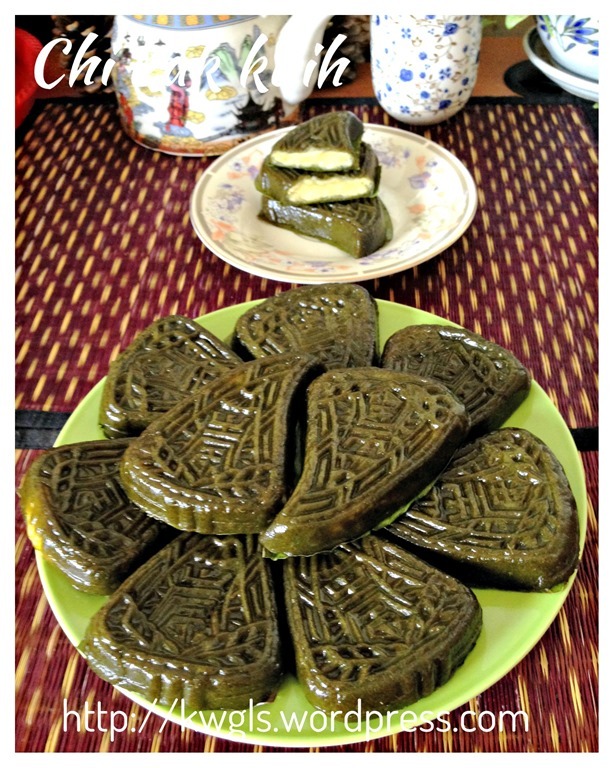 Chi kak kuih of Teochew dialect and Orh Ku Kuih of Chawan dialect in essence is the same steamed rice cake except the mould is different, Chawan being influenced by Hokkien dialect in Fujian province are using tortoise mould as opposed to the peach mould that is well liked by Teochew dialects. 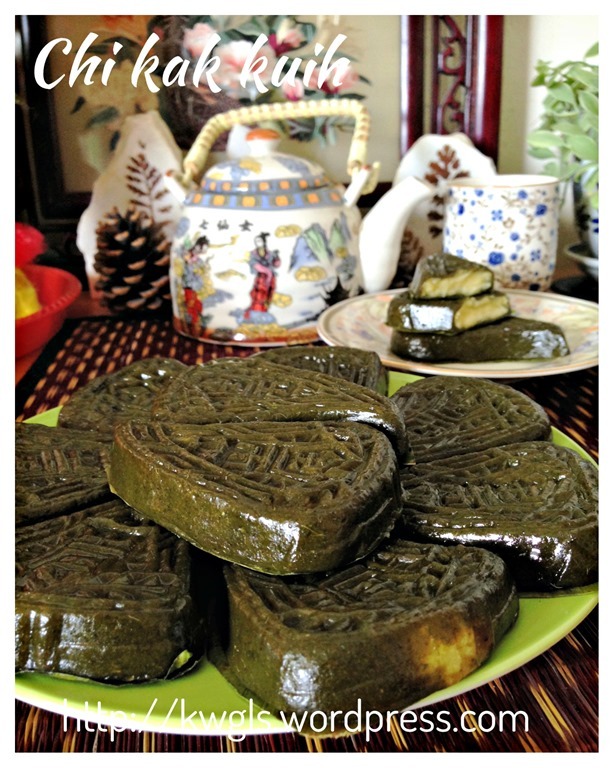 Traditionally, Orh Ku kuih in Zhao An (诏安） is also prepared using cudweed instead of mugwort. However, when my parents relocated to Sarawak, as there is no such cudweed available, mugwort were therefore used.. 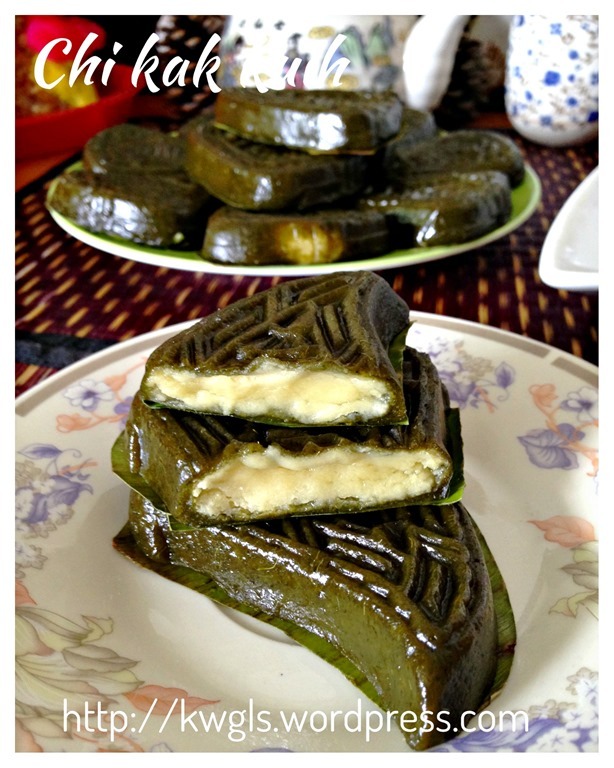 Steam the soaked mung beans and pandan leaves under high heat until soft. It took me about 25 minutes. 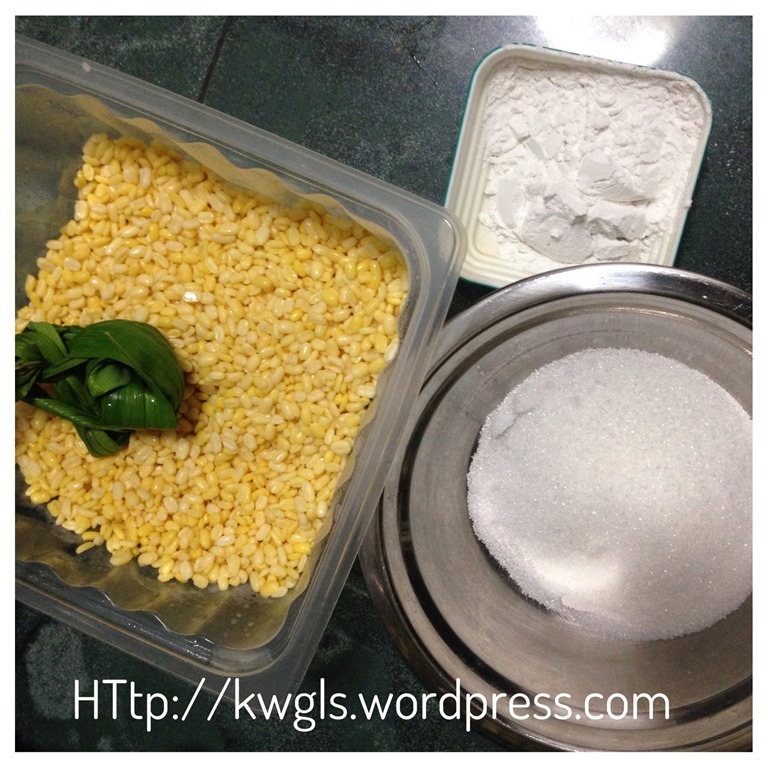 Throw away the pandan leaves and transfer the steamed mung beans to a food processor, blend until fine. Add the sugar and starches, continue to blend until it form sticky paste. Transfer out and set aside. 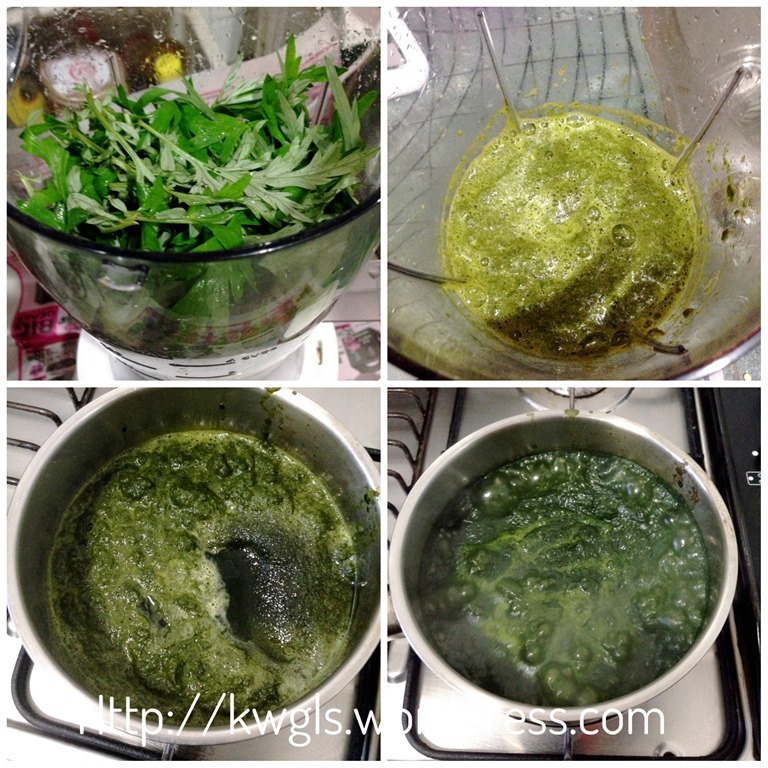 Blend the cudweed or mugwort leaves in a blender with the 200 ml of water. Blend until as fine as possible. Transfer to a pot, add sugar and cooking oil, bring to boil. Let it boil for at least 10 minutes and set aside for cooling. Steam the sweet potatoes until soft. Once steamed, transfer to a food processor, blend until fine. 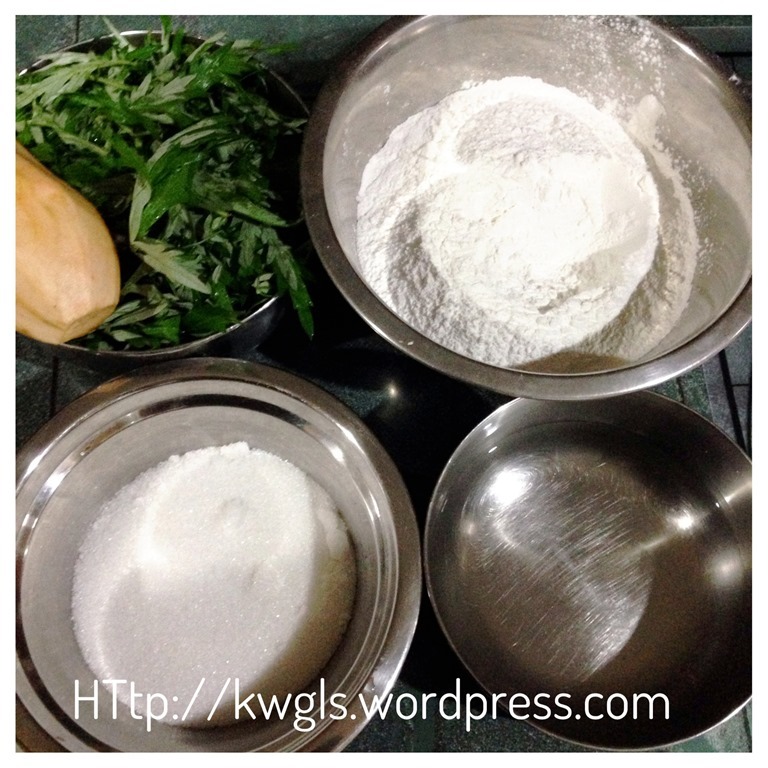 Add the glutinous flour and add the mugwort mixture gradually. Blend until it form a pliable dough. 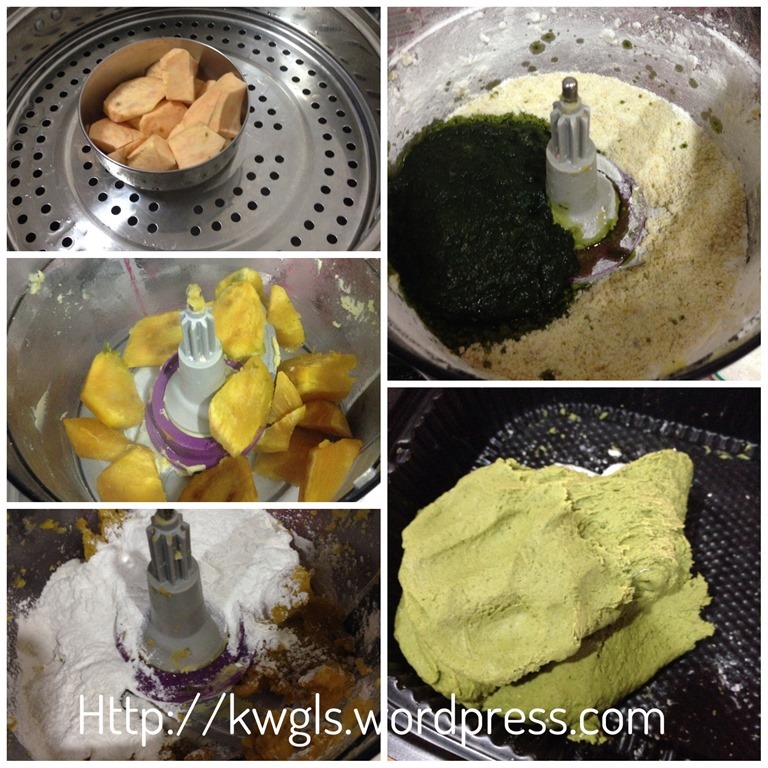 Note that the use of food processor is optional and you can do this manually if you do not have a food processor. Depending on the water absorbing of the flour, you may not need to use up all the mugwort mixtures. As such, you have to add gradually. If your dough is too dry, add “HOT WATER” tablespoon by tablespoon. If your dough is too wet, add additional glutinous rice tablespoon by tablespoon until the dough is pliable. 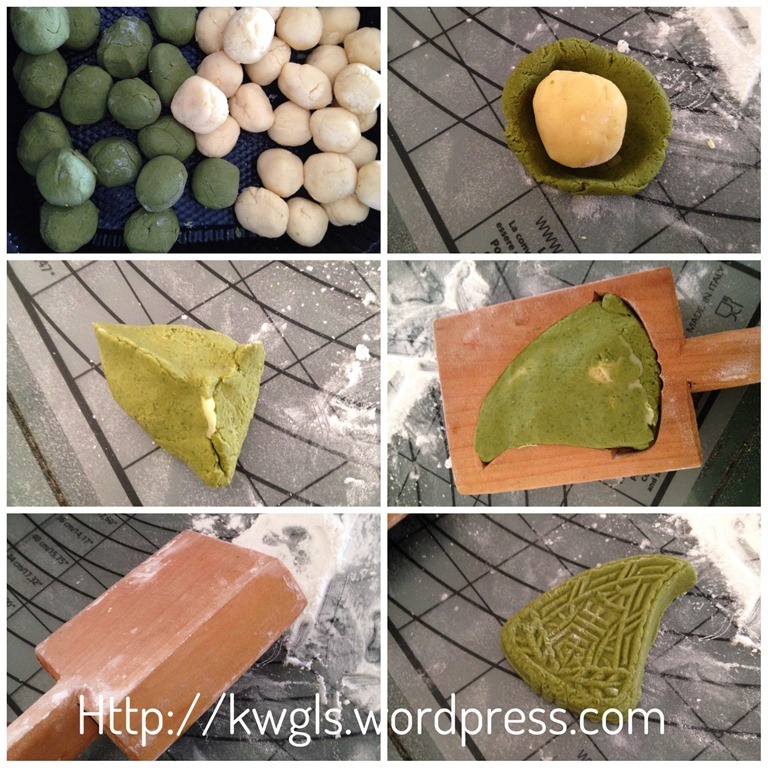 Divide the dough and mung bean fillings into about 30 grams each. This is for my mould and it is advisable that you try wrapping and moulding one to find the optimum dough and filling weight. Every mould is different. If you are not confident of your wrapping, you can increase the dough : filling ratio from 1:1 to say 35grams of dough to 30 grams of fillings. Take a dough, shape round, lightly press flat, put a filling on the centre, seal the edges and shape triangular. 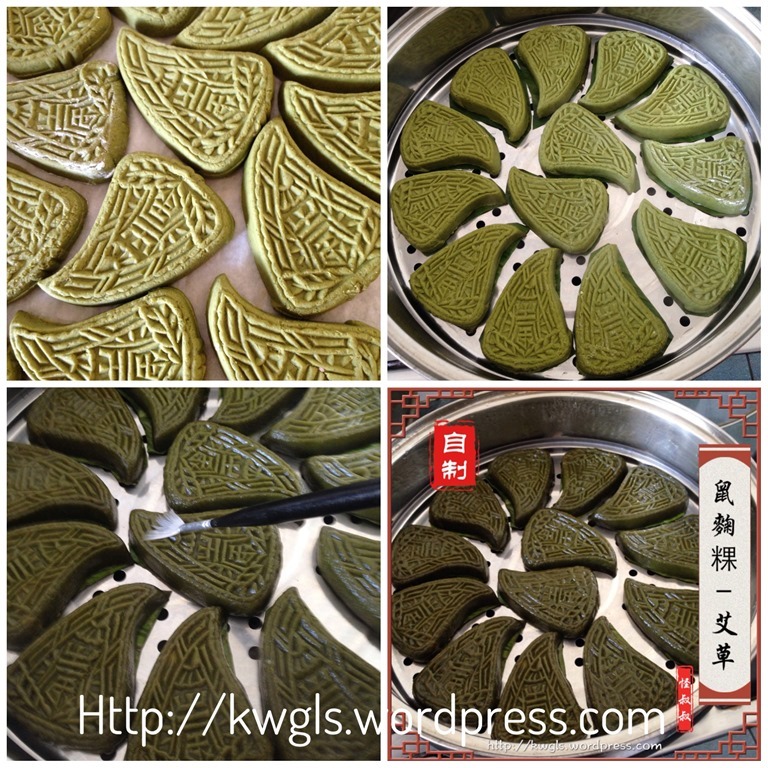 Press the rice cake onto the mould following the shape of the mould. Press down firmly and dislodge the rice cake by knocking the mould on the table. 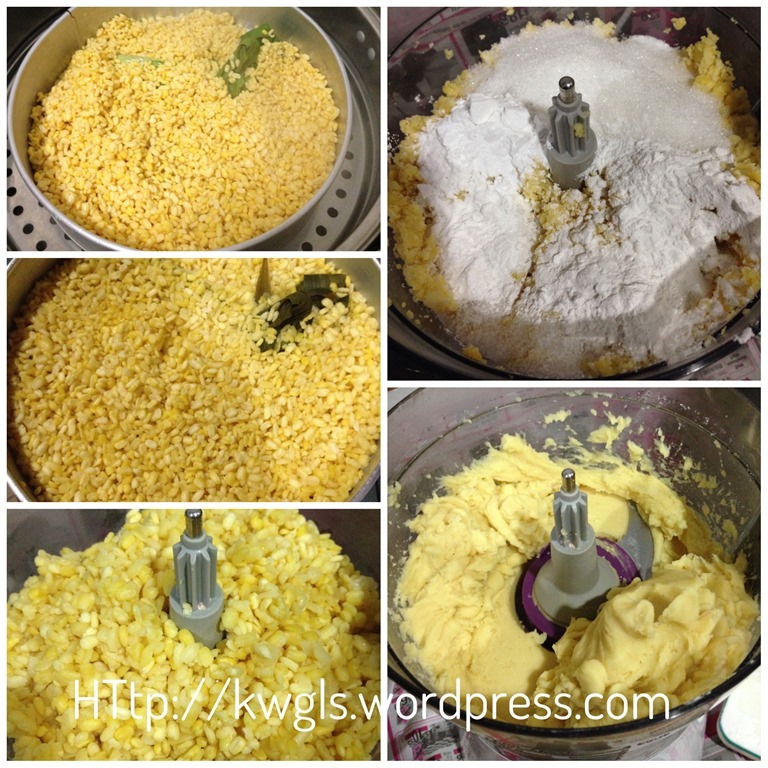 Practically, the dough should not stick to your mould. However, if it happens, just dust the mould with some glutinous rice flour before proceeding. Get ready a steamer with adequate water to steam at least 10-15 minutes under high heat. Place the rice cake in a piece of lightly greased banana leave and transfer to the steamer. Steam the rice cake for 10-12 minutes under high heat. Before transferring out from the steamer for cooling, lightly brush the rice cake with some cooking oil. Store the rice cake in an air tight container when they are completely cooled. If the rice cake turns hard on the next day, re-steam the rice cake for another 5 minutes will bring back the freshly prepared texture. This is a rather long recipe. Don’t be discouraged.. It is not that difficult if it was prepared with a bit of planning. 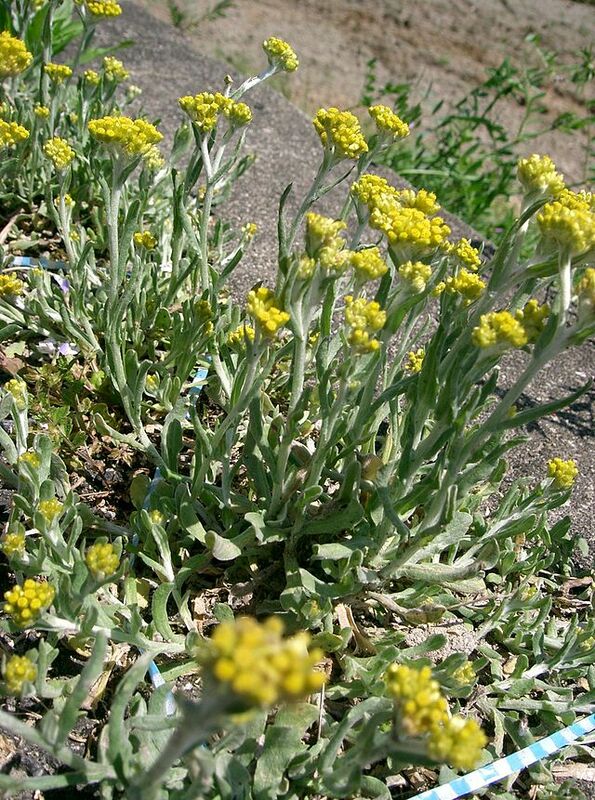 Once again, if you are able to get hold of the fresh or dried cudweed, please used that. Otherwise, you can use mugwort to substitute.. 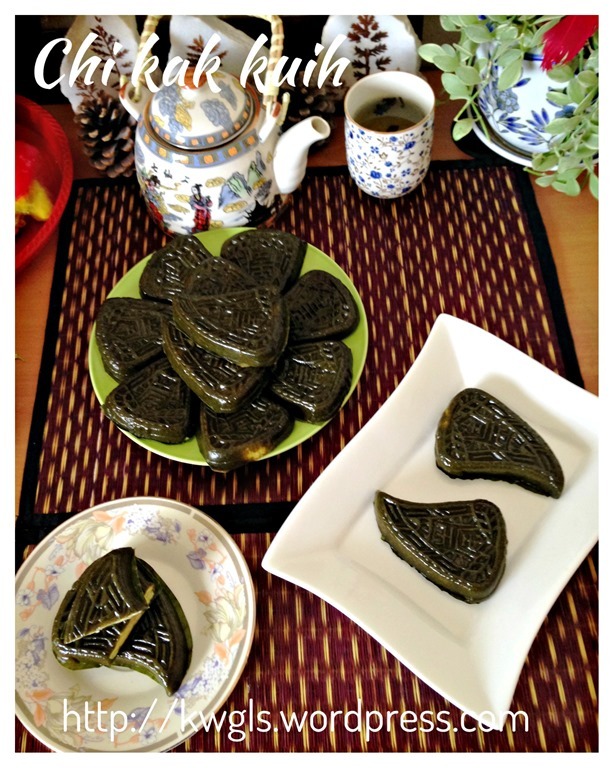 This entry was posted in Chinese and Asian Cakes and Snacks, Food Preparation Series and tagged 8, chi kak kuih, cudweed, 鼠麹糕, 鼠壳糕, GUAI SHU SHU, Guaishushu, kenneth goh, mugwort, postaday, Teochew Kuih. Bookmark the permalink. HI shifu, may i know what is the blender brand you are using in the picture? And where can i get mugwort too? Hi Kenneth, may I know where to buy Mugwort leave?